With Jaipur complete we faced the arduous trip from Jaipur to Delhi. How long would it take? The answer was 5 – 8 hours. Who knows? That is the joy of traveling in India. A couple hundred kilometers is a trip into chaos where anything can happen. The good thing about that? Lots to see. A few shots from the drive. 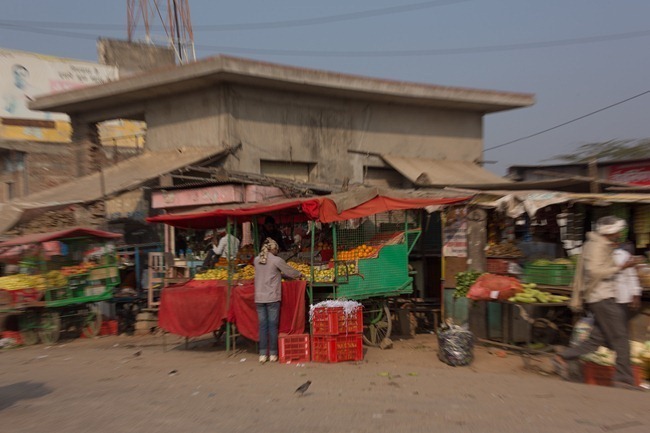 While we were in India I read all about multinational business failure in India’s food market. It seems like the country is not ready for wide-scale, super market led food distribution. Read the article on the Journey of an Indian Onion from the Economist, fascinating. One of the many, many markets that we passed as we drove to Delhi. One of the local distribution engines in action. If you tried loading your truck up like this in Canada, you wouldn’t make it 2km before the police had you stopped. Of course, the police would have to find you and get to you first. It might be hard to conduct a police chase on an Indian highway .. with all of the tractors, cattle, camels and everything else in between. These guys didn’t seem to mind the traffic. One last shot of a potter, by the side of the road; who needs some help organizing. It took us 7 hours. Time seemed to fly by. This entry was posted in Our Asia Adventure, Photography and tagged camels, Canon 5D Mark III, cows, Delhi, driving, India, Jaipur, markets, street photography, tractors, traffic by michaelweening. Bookmark the permalink. I love how even the Massey Ferguson is decorated. Imagine my brother’s tractors like that?